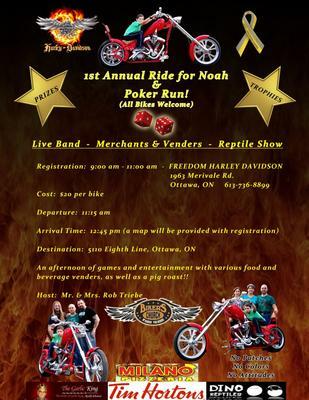 1st Annual Noah Nairne Fundraiser & Benefit Bike Run,sponsored by Freedom Harley Davidson Ottawa. This is to bring to your attention that one of our young bike enthousiasts, is currently undergoing something that no family or parent should go through. Noah is trully inspirational to all those who know and love him, he continues to smile and be a brave little boy as he carries on with his battle. At the end of May 2012, 11 year old Noah Nairne, had a seizure at school. Shortly thereafter, he was diagnosed with Grade 3 Anaplastic Astrocytoma (brain cancer). 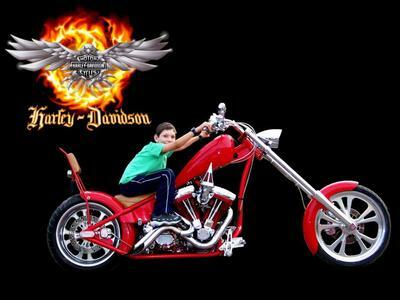 In June, he was transferred to Toronto's Sick Kids Hospital where he had surgery to remove a tumor. The surgery went well and Noah was sent home within a few days. Unfortunately, 3 weeks later a second tumor was discovered which was deemed inoperable. CHEO (Children's Hospital of Eastern Ontario) doctors determined that the best course of action for Noah would be a 6 week daily session of chemotherapy along with a 6-week (5days per week) radiation session. Noah has completed this first stage and is now beginning the next..bi weekly chemotherapy that will last for one year. To assist them, family, friends and loved ones will be holding a fundraising benefit on May 25th, 2013 beginning with the Motorcycle Ride for Noah sponsored by "Freedom Harley Davidson Ottawa, 1963 Merivale Road, where you may register between 9am - 11am, and ending at 12:30 pm at the following address:" 5110 eighth line, Ottawa Ontario", where your in for an afternoon of games, live band, entertainement, refreshments, food vendors and merchants followed by a pig roast donated by T.& M. Distribution,. There are several prizes and trophies to be won, your in for a treat so bring your game on! What a great opportunity for friends and fellow bike enthusiasts to get together to raise funds for a worthy cause. Lets pull together, we are appealing to you for donations to assist this family so that they may be able to financially breath a little better and lessen the stresses so that they may focus peacefully on their family time. If you know anyone who would like to make a donation, they can now do so via PayPal. Please send them the lik below. Donations can be sent to the following eMail address: buttonfield1639@yahoo.com and can be done by either PayPal balance, bank account and/or credit card. Those who wish to send cheques if they prefer; Papal is just another option. Cheques should be made to Richard Nairne and mailed to the attention of : Scarlett Russell 6126 Buttonfield Place, Ottawa, ON K1W 1B9. Thank you in advance for any contribution.